(or Monmouth Court House) About 30 miles from Trenton. County Courts held here 1735. Scene of Battle of Monmouth June 28, 1778, between Clinton's Army retreat ing from Philadelphia and the Continental Army under Wash, ington in pursuit. Freehold and vicinity settled mainly by Scotch. The town originally called Topanemus, had its origin in the building of a Court House in 1715 when it became the County Seat. Monmouth Battle Monument. Corner Stone laid June 28, 1878. Unveiled November 13, 1884. Marker at Molly Pitcher's well, near road from Freehold to Englishtown near Pennsylvania Railroad. Molly Pitcher died in Carlisle, Pennsylvania, January 22, 1832, and is buried in the English Graveyard. Marker on Englishtown Road showing where Washington met Lee. Hankinson Mansion on "Old Burlington Path," or Main Street. Headquarters of Sir Henry Clinton, June 27, 1778. House erected 1755. Old Tennent, formerly Old Scots, Church built 1751. Three miles southeast of Englishtown and three miles from Freehold. Originally called Old Scots Church, then Free, hold Church. 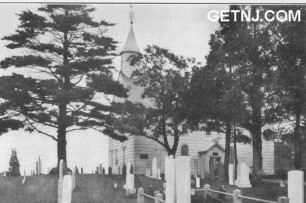 In memory of John Tennent and William Tennent, Jr., it took the name of Tennent Church. It was the successor of an older church built 1730, which seems to have been the successor of the Old Scots Meeting House built 1692 by the original Scotch settlers on or near the site of the Old Scots Burying Ground. The outlines of the old church can still be seen on the road leading to Englishtown about two miles from Freehold, in Marlboro Town, ship. The oldest grave in the yard is that of Rev. John Boyd, first Minister of the Church, who died August 30, 1708; the oldest in the present Tennent Church Yard is that of Alice Smith, died 1739. Rev. Wm. Tennent, Pastor of the Church for over forty-three years, who died March 8, 1777, is buried under the floor of the central aisle. At one corner is buried Lieutenant Colonel Monckton of the British Army, killed June 28, 1778. St. Peter's Church. Throckmorton Street. opposite Pennsylvania Railroad Station. St. Peter's Church had its origin in a Quaker Meeting House built by George Keith, about a mile west of Marlboro, about 1695 and never finished. On Keith's defection from the Quakers about 1702, the building was taken over by the Church of England and was used by that church in 1751. It was removed to its present location in Freehold between that time and 1763, the new church being built in part with the timbers of the old church. A piece of land was donated at Freehold in 1709 for the erection of a church. The church, which was not completed for three-quarters of a century, was consecrated May 8, 1836, by Bishop Doane. The oldest tombstone in the old Topanemus or Freehold graveyard is that of Elizabeth Clark, died December 25, 1697. Cincinnati Hall. 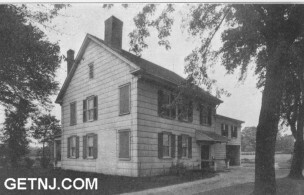 First house in Freehold burned by the British on the day of the Battle of Monmouth. Re-erected shortly after the Revolution by Dr. Thomas Henderson on the old foundations. Named Cincinnati Hall in honor of the Society of the Cincinnati. First Court House constructed 1715 of wood -- destroyed by fire December 17, 1727. The second Court House built 1730, and used for more than seventy-five years, was standing in June, 1778. The third Court House erected 1806 was destroyed in 1873. Original site marked in 1905 by stone from Rocky Hill placed by Samuel C. Cowart, bearing bronze tablet with inscription "Site of the Old Monmouth County Court House used as a hospital in the Battle of Monmouth, June 28, 1778." Pew in old Tennent Church endowed by Tennent Chapter, D.A.R., June 14, 1921, in memory of George Washington. (formerly Blue Ball) About three and one-half miles south of the Court House in Freehold. At a short distance north of the hamlet is Shumar's or Morgan's Mill. There Colonel Daniel Morgan with his corps of riflemen waited during the whole of the day of June 28, 1778, for orders to take part in the Battle of Monmouth. The Bethesda Methodist Church at Blue Ball, founded about 1780, is the oldest Methodist Church in the State. Present church built in 1849. MARLBORO on road from Freehold to Bradevelt. The Old Brick Church-known as the Reformed Church of Navasink and afterwards as the Dutch Reformed Church dates to days of the earliest Dutch settlements; was organized about 1699. Present building erected 1826. Birthplace of General David Forman, Commander of the Jersey Troops at Germantown, friend of Washington, Judge of the County Court, and Member of the Council of the State. Village House erected in 1732. It was here orders were framed for the court martial of General Charles Lee. Sixteen miles northeast of Freehold. Middletown, a settlement made by men from Gravesend, Long Island, in 1665, was originally a Baptist settlement. The church, organized about 1668, was the first Baptist Church in the State. The first building was torn down in 1734, and another constructed, which was succeeded by the present church in 1832. On the Main Street, nearly opposite the Baptist Church, is an old burying ground known as the Presbyterian Yard, the oldest grave being that of John Boune, died 1715. Mount Pleasant Hall, about one and one-half miles out from Middletown on the Middletown Turnpike, built 1752 by the father of Philip Freneau, the Poet of the Revolution. Fre quently visited by James Madison in his young days. Nothing but remains of the house are to be seen now. Freneau and his wife are said to be buried in the family burying ground at Mt. Pleasant. Burrows Mansion still standing in the village, erected in the first half of the eighteenth century. Tradition says, the first New Jersey company formed for the Revolu tionary War was mustered in the garden, marching to Long Island to join the army of Washington. One mile north of Beacon Hill. Spot where British embarked for New York after the. Battle of Monmouth, also scene of the murder of Captain Joshua Huddy. First lighthouse built 1762. Seized and fortified by British. Attacked by Monmouth County Militia under General Forman. Five miles from Freehold, on a neck of land formed by two branches of Swimming River. Home of Joshua Huddy, whose house at Colt's Neck was attacked in 1780 by a party of Loyalists commanded by one Tye, a mulatto. Huddy, who was captured at the defense of Tom's River, March 1782, was carried to New York and executed April 12, 1782, by the Loyalists. He was buried at Freehold with the honors of war. For this "barbarous outrage against humanity" the Board of Loyalists was forbidden to remove any further prisoners and was abolished by Sir Guy Carleton. Settled by emigrants from Connecticut 1664. Episcopal Church established about 1702, chartered June 3, 1738. Friends Meeting House, established prior to 1672, visited by George Fox, George Heath, and others. Original Meeting House now in possession of the Hicksite Branch of the Society, the Orthodox Friends having built a new Meeting House at the time of the separation. Presbyterian Church founded about 1735. Chartered 1749 in connection with Freehold and Allentown.